"This dessert is fun to make and eat. Fresh fruit, especially berries and kiwis, balances the sweet, gooey crunch." 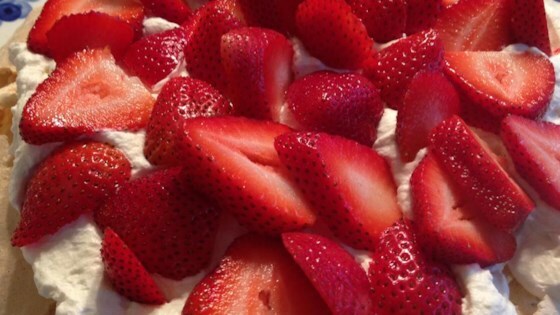 I made this just as stated in the recipe, and it is a beautiful dessert, however, the pavlova is just too sweet for our liking. Next time I make this I might just exclude the whipped cream... don't need the calories and the "meringue" is awesome by itself!!!!! Wonderful. I used mixed fruit: strawberries, blueberries, peaches and kiwi instead of just the strawberries cause that's what I had. My guests love it and we ate the whole thing up.